Stock up on the popular sizes! 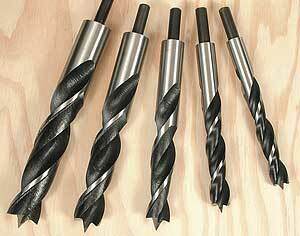 Features the most popular twist and brad point drill bit sizes. 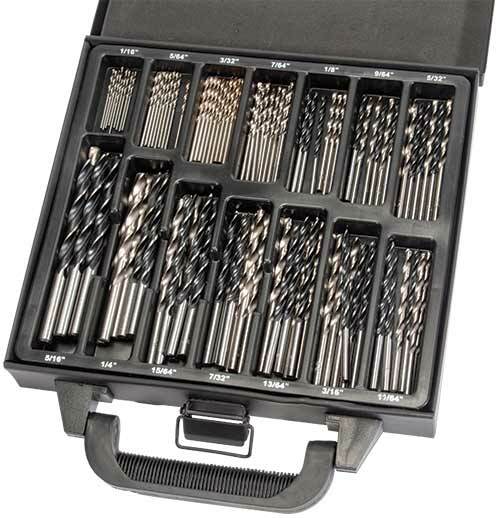 Custom heavy duty case and insert keeps bits organized, where you can find them, when you need them. 1/8", 9/64", 5/32", 11/64", 3/16", 13/64", 7/32", 15/64", 1/4" and 5/16"
A complete drill bit set! Includes bits from 1/8" to 1/2" by 1/64" increments. The in between sizes are especially useful for doweling to get that “just right” fit. A metal case and bit holder are included. All the holes in the bit holder are labeled to help you select a drill size. 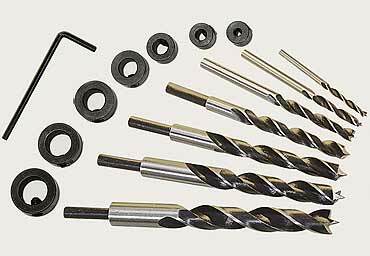 Advantages of Brad Point drill bits. 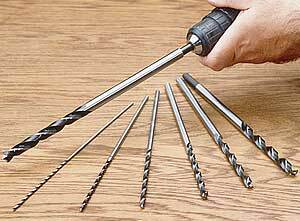 Brad Point drill bits are designed to drill flat bottom holes in hard or soft woods, composites and plastics. These bits will not move off center through unusual grain or knots. All bits are deep fluted to clear chips, quickly, and the shanks are stamped with the bit size. Larger size bits have reduced shanks. Color of box may vary. HSS Set #9193 shown. SAVE $5! List price $34.95. I bought what looks to be this same set several years ago from MLCS. I've used most of the bits many times and they still are sharp. The in between sizes come in really handy when I don't have a dowel that fits a standard hole. 7 extra long Brad Point drill bits. 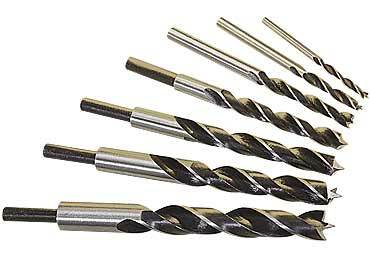 7 piece set with 12" long brad point drill bits. The set includes the following sizes: 1/8", 3/16", 1/4", 5/16", 3/8", 7/16" and 1/2". Jumbo size Brad Point drill bits. Includes sizes: 9/16", 5/8", 3/4", 7/8", and 1" increments. Sharp bottom center points and sharp spur sides which start holes easily, shaving smooth holes and exiting cleanly. 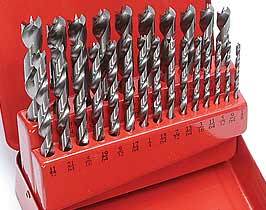 Jumbo Brad Point drill bits. List. $60.00. These bits have the unmachined forged shanks. This causes the bit to run untrue. When I chuck them up in the drill press ,I have to rotate them to find the true spot on the shank and then mark them to match a mark on the chuck so that the next time I use them I can chuck them up without having to find the true spot again. They are nice bits for the price and I would rate them higher if it wasn't for that flaw. When I chuck up a drill bit,I expect it to run true. 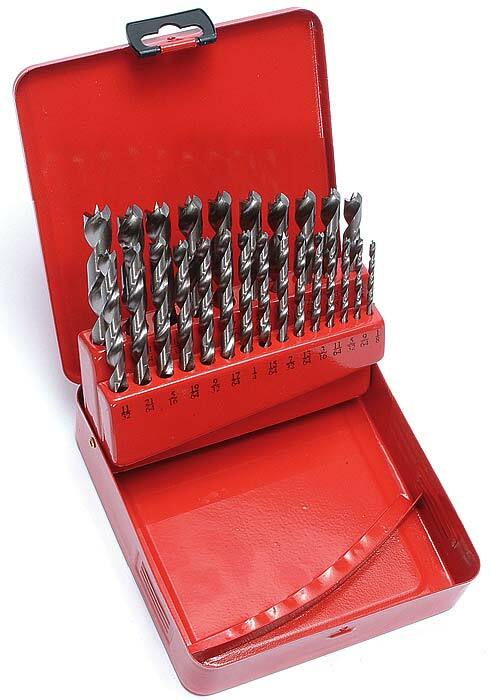 Includes 7 piece brad point drill bit set #9153 and 7 piece locking stop collar set #9157. 14 Piece Set. List. $24.95. 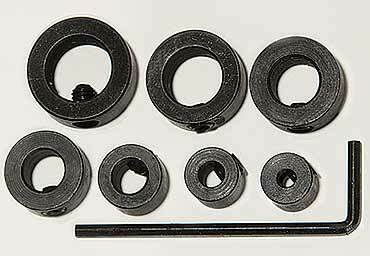 Includes sizes 1/8", 3/16", 1/4", 5/16", 3/8", 7/16", and 1/2". 7 Piece Set. List. $14.95. Use with 7 pc. brad point sets #9150 or #9153. Collar is secured around drill bit by hex screw. Allen wrench included. Sizes 1/8" - 1/2". 7 Piece Set. List. $9.95.